En route from London (LHR) to Salzburg (SZG) at an altitude 19000 feet the rear pressure bulkhead ruptured. An explosive decompression of the fuselage occurred, causing serious interior damage and severe distortion of upper tailplane skin attachments. The tail surfaces subsequently detached, causing the airplane to enter a steep dive. The Vanguard spiraled down out of control and crashed in a field next to a highway. During the investigation corrosion was found in the lower part of the rear pressure bulkhead underneath plating that was bonded to the structure. The bond was completely delaminated in this area and the bulkhead material literally eaten away. Fluid contamination, perhaps from the lavatory, was thought to have been the root cause for the corrosion. 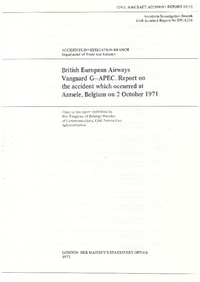 CAUSE: "The accident was caused by the rupture of the rear pressure bulkhead, which led to the separation both tailplanes in flight and caused the aircraft to dive into the ground." Inspections of other Vickers Vanguard planes revealed similar corrosion in eight other aircraft. Inspection procedures were revised and the airplane was modified to improve access to the inspected area. The frequency of inspections was increased considerably. Distance from London-Heathrow Airport to Salzburg-W. A. Mozart Airport as the crow flies is 1043 km (652 miles).